Here’s a good page from April of 59 and it’s chock full of special orders. A couple of stop tail 355’s show up here which I’d really like to get my hands on. So, you get a rare black ’59 ES-345 from a guy who says he got it from a guy who got it from his now deceased cousin who special ordered it from Gibson in 1959. Black was a custom order only color and there aren’t very many of them. You think it’s legit but how can you be sure? The short answer is to have an expert look at it and tell you what he thinks but a good refinish can be tough to spot. You can also call the folks at Gibson customer service (who, by the way are very nice) and try to get the shipping ledger page for your guitar and see if it shows any special order information. They seem to have gotten a little tight fisted with this information lately but I guess it depends who you end up talking to. In any case, it’s always worth a try but it can be pretty frustrating because Gibson didn’t always note these things in their records. It seems that in 58-60, they noted a lot of custom order information but later, it all but disappears. If you look at a mid 60’s page, there are generally no special order designations at all. Here’s a good example–I had a pair of very clearly custom ordered black guitars two serial numbers apart made in 1966. One was a 330 and the other a 335. They were allegedly ordered by the same buyer at the same time. Both had gold hardware, fancy 355 type bindings and bound f-holes. I asked Gibson for any information they could find on these two guitars and they told me none existed. I was later told by another dealer (who was interested in the 335) that he was able to find the page and that no special order designation was noted. So much for accurate record keeping. I guess they were kind of busy at the time considering that yearly 335, 345 and 355 sales went from hundreds in the late 50’s to more than 6000 in 1966-the heart of the so called “guitar boom” (thank you John, Paul and George). Even when you are able to find your guitar on a page that you find on the internet (there are quite a few out there), you may not be happy with the result. I have acquired three black ES-345’s in the past year. They are stupid rare and always subject to very close scrutiny by me and by my buyers. All three have been so-called “first rack” 345’s and two of them are only a few serial numbers apart. I asked the folks at Gibson for the ledger pages and they very kindly sent them to me. The first 345, a stop tail from rack S8539, was clearly noted on the page with a pair of initials and the word black. The Bigsby 345 was from the same rack S8539 but had a much later serial number. So does the other stop tail that is 13 numbers away and from late in the previous rack (S8538). The likelihood is that they painted a few of them black and put them aside to cover any special orders. But, these last two don’t show up as black in the ledger and that’s frustrating. They simply show up as ES-345’s. The lesson here is that you can use the ledger pages to prove whether a guitar was custom ordered if it is so designated on an available ledger page. The other lesson is that you can’t use a ledger page to prove that a guitar wasn’t custom ordered because the pages are pretty inconsistent. It’s pretty interesting stuff and can be a fascinating snapshot into the goings on at the Parsons Street factory back in the day. Looks like a busy day at Parsons Street. How can you get any work done around here with guys like Les Paul and Ted McCarty doing photo ops while you’re trying to build a guitar? Here’s the adjacent page to the one at the top and there on the right side is the very first black 345 with the designation J.H. Black. I suppose it could have been another sunburst 345 sold to someone named JH Black but I had it in my hands and, sure enough, it’s black. A special order Byrdland for Hank Garland is there too. Pretty cool stuff. Charlie, very cool…yes, using this info can be a bit like being a detective. Might just provide another clue to help “solve the case” about your guitar’s origin! I was fortunate to get shipping ledger documentation on 3 of my 4 vintage Gibsons and Epiphones. They didn’t have anything on my ’56 LP Standard. Great post, Charlie! 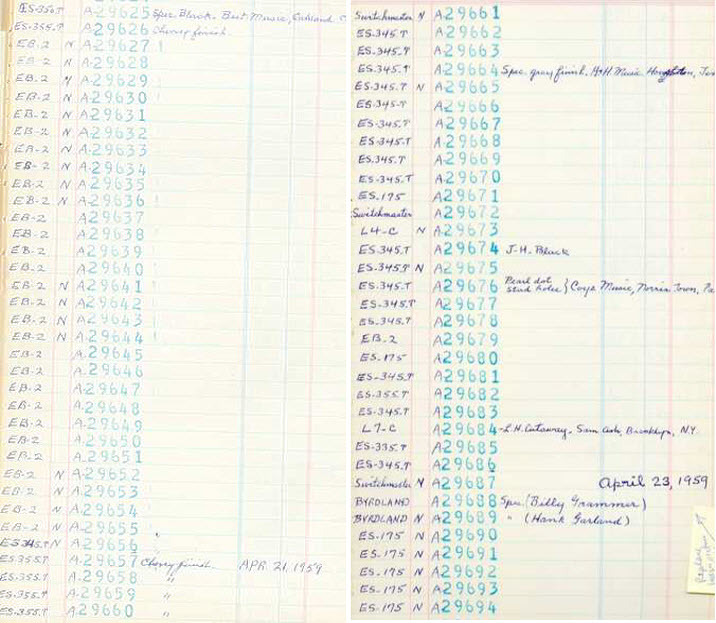 So is there an online source for checking pictures of the actual ledger pages, or do you have to send requests directly to Gibson? If the latter, what is the protocol for making the request? TIA. 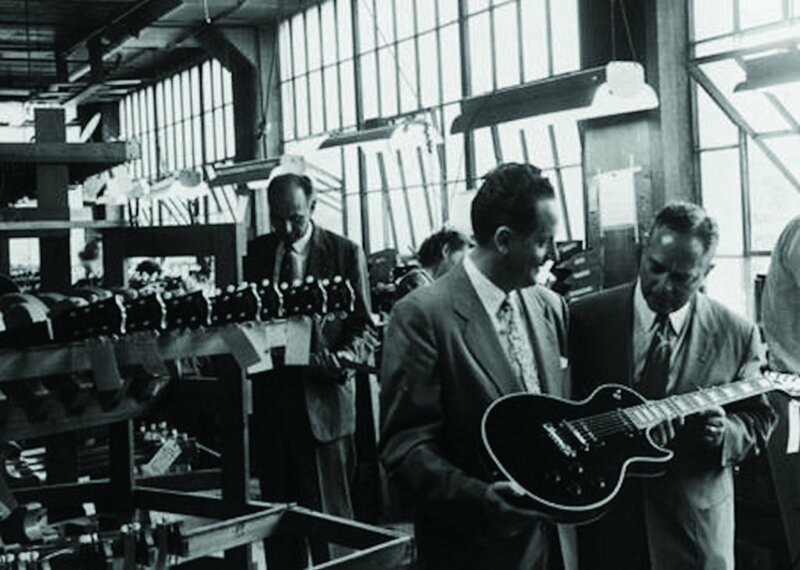 The guy stood in the background of the Les Paul photo is, I believe, John Huis who was Ted’s second-in-command. There is no online source-that would be a good thing if Gibson would do it. Or, better yet, Gibson could publish the pages they have and sell the book for $20. There are a number of individual pages out there on the internet-just do a google image search for Gibson ledger. $20? Shoot…i would pay $80 for that book. Is the first entry of the 2nd page shown, for a black es-350T? I would love to see that! I would not conclude that the ledger is inconsistent. Based on your reasoning I might argue that my 335 is cherry if is the ledger shows nothing. If the 345 or 335 has no colour designation then it must be sunburst. Unless you are referring only to custom colours . Then what is a custom colour? Cherry appears not to be a custom colour yet is always mentioned even when the default colour is cherry as your ledger shows on the 355s. Cherry 335s are also listed as cherry but sunburst are never listed as sunburst. It seems quite consistent. The higher the serial number the later it shipped in the year. In fact unlike the 60s ledgers the date an these 50s ledgers are entered and all the guitars for that day are registered. 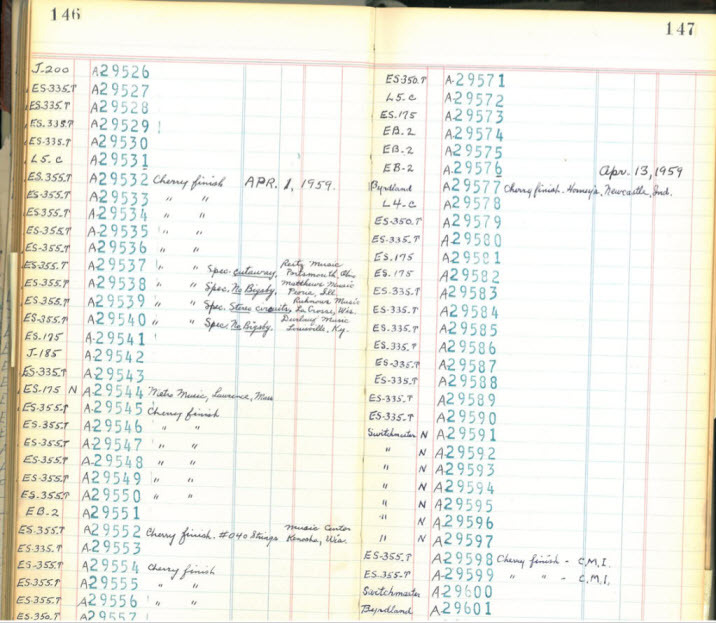 Where did those 1959 shipping ledger scans come from? I thought the 58-60 ledgers were lost like 40 years ago! The Les Paul ledgers were lost (stolen, I think). The ledgers for most other models are at Gibson and they don’t share them easily. I have perhaps 15 pages from 58-64 and that’s about it.